Traveling Tea Set for the Royal Party. 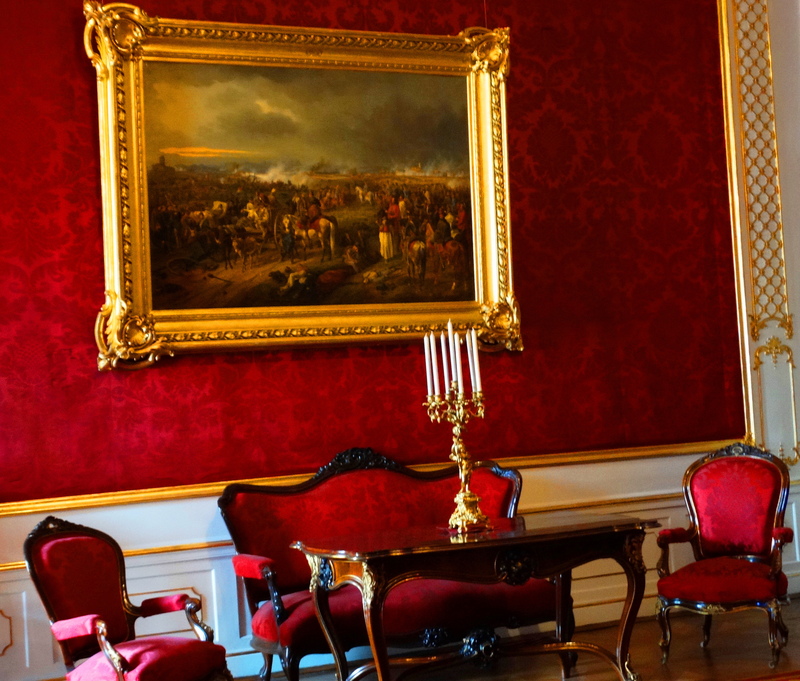 When in Vienna in May of this year we visited The Hofburg Imperial Apartments which contain The Winter Imperial Apartments, the Royal Silver Collection and The Imperial China Collection. Each different pattern you see in a photo, represents a different complete set of royal china to serve up to 140 royal guests. 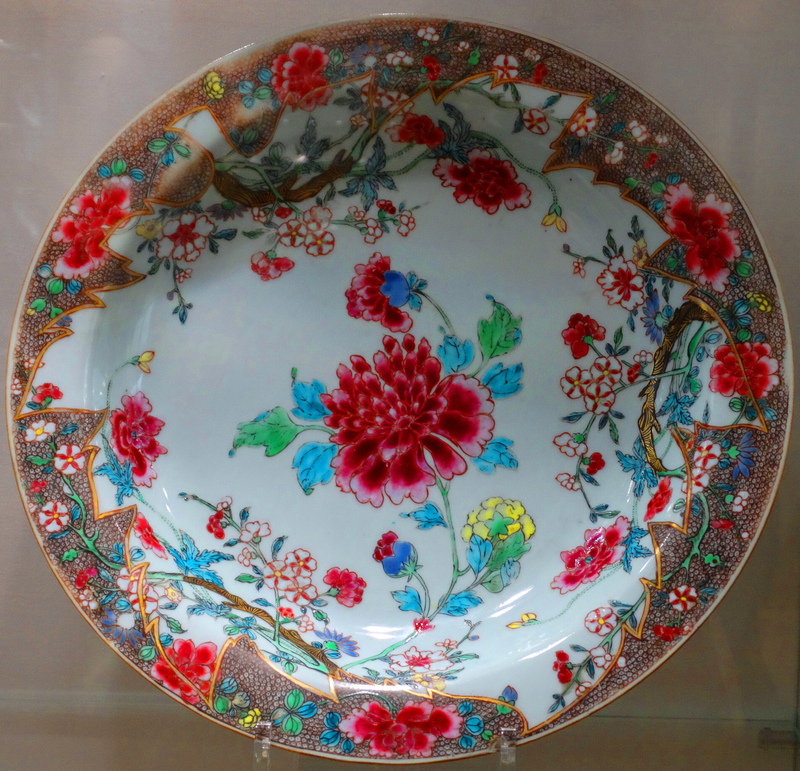 This museum is filled with a VAST fortune of antique china services, each to serve large numbers of guests. It also contains vast stores of silver flatware and serving pieces to go long with each china service. It seems hard to justify this type of over the top opulence, when poor people at this time had hard and difficult lives. All the sets had coordinating center pieces and serving dishes. The palace was home to the Hapsburgs for 600 years. The furnishings and china you see in these photos date from the early 18th century to the mid 19th century. There are more patterns that I took sample photos of that I liked. If anyone is interested in seeing them, I will post them, but I didn’t want to bore your with too many examples. 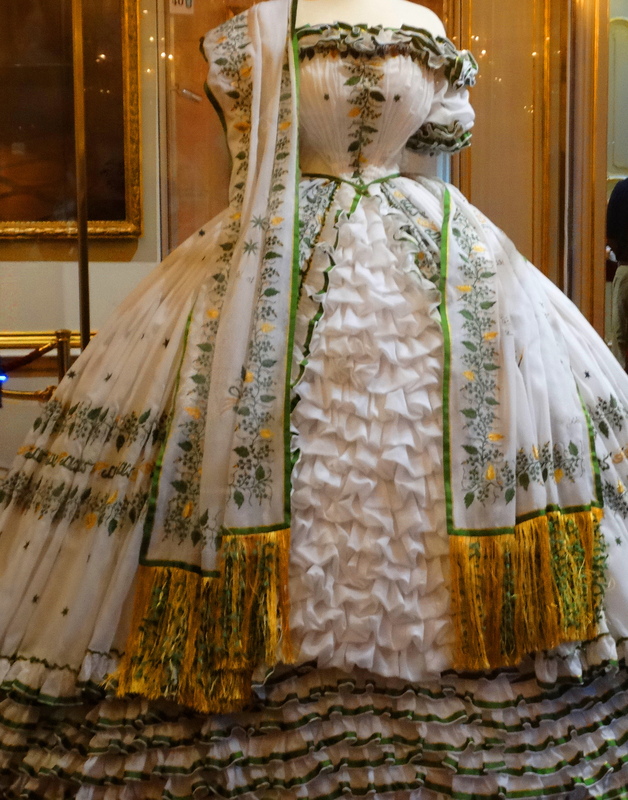 If you were the hostess of one of these dinners, this is the dress you might wear, an actual dress worn by Empress Elizabeth. 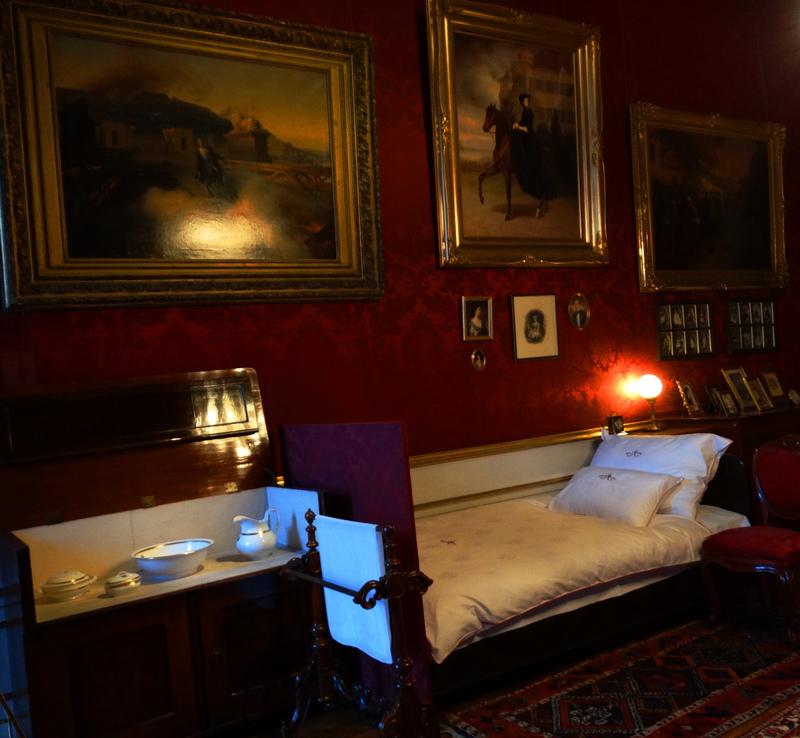 And if you were the King Franz Joseph, this was your bedroom. I didn’t know I wasn’t supposed to be taking pics here……but I did find out! So enjoy these rare photos. I definitely gravitate to the Asian ones. I love them too!! The more they had, the more they wanted. Impressive collection! Some would say that the images are examples of gracious living.. Other would say excess and lavish. It’s never a simple: steeped in culture and history and economics and society. Vienna is a gorgeous city. Did you inherit any plates? I don’t know how you get around to so many interesting places, but I’m glad you do and that you share it with us! The china in the first photo along the back wall is my favorite. Gorgeous items you have captured! beautiful, such bright vivid colors…love that gown, it is gorgeous! not sure it would be easy to sit, but certainly looks wonderful! love the shots Cindy! Beautiful pieces. 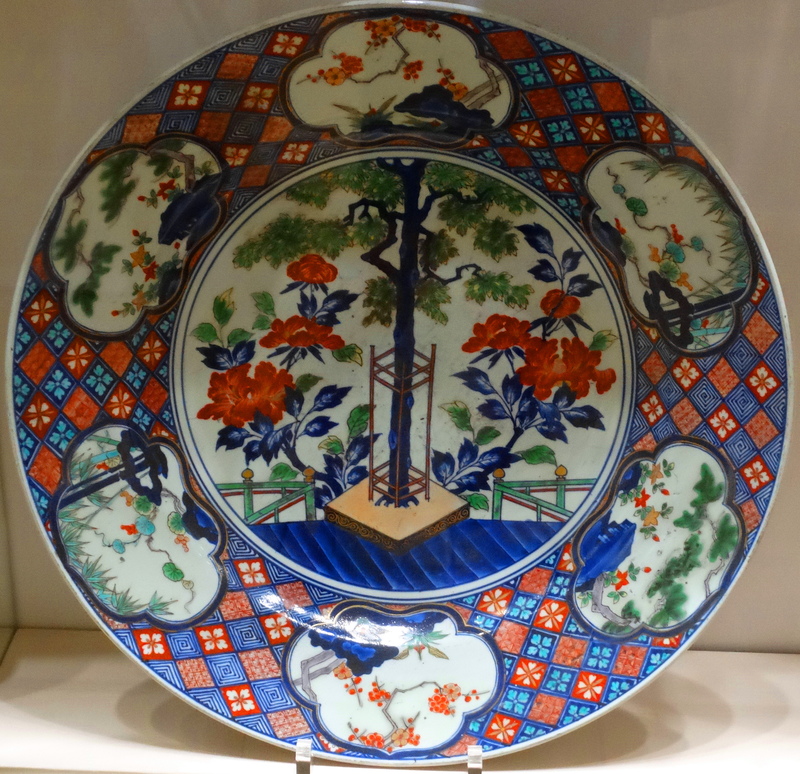 The patterns or designs on the plates appear to be Chinese style. Is that what originate the word “china” ? The dress seems awkward to wear. I am trying to imagine how to sit with the dress. Yes I picked the Asian designs to photograph because they were my favorites. There were many other traditions represented that I didn’t photograph. I”m going to google the origin of the term china to refer to china sets and will let you know. Very interesting and I don’t know the answer. That dress would be a bear to wear!! Cheers to you my friend and happy weekend! I would too…..but I suppose I could force myself!! lol! Thank you Jalal & cheers to you! Quite colorful china & tea set! Add a crown to the whole ensemble and I would pass out!!! lol! I’m such a bull in a china shop, I would have to be wrapped up in bubble wrap before anyone let me near that. Your photos are great! They are quite safely tucked away from all us bulls!! lol. The Asian artistry is so beautiful! I would too!! What beautiful and elegant china. I don’t think I could move in that dress! Ok I couldn’t eat off any of these.. I would be to afraid to wash them but wouldn’t let anyone else do it because I would get SO mad if someone chipped them. But not if I chipped them… I’d just be mad at me! Exactly! If one I acquired anything this fine, I would immediately start to worry about it!! Wow…can’t put them in the dishwasher…no thanks! Have I ever told you how much I love your comments!! Laughing…….again! Then my job is done…dropping the mic and walking off stage! Poor things. However did they survive with just simple, plain everyday items? Life I realize must have been hard for them…..bazinga!!!! It’s tough to be the king…….NOT! Oh, I collect Wedgewood! 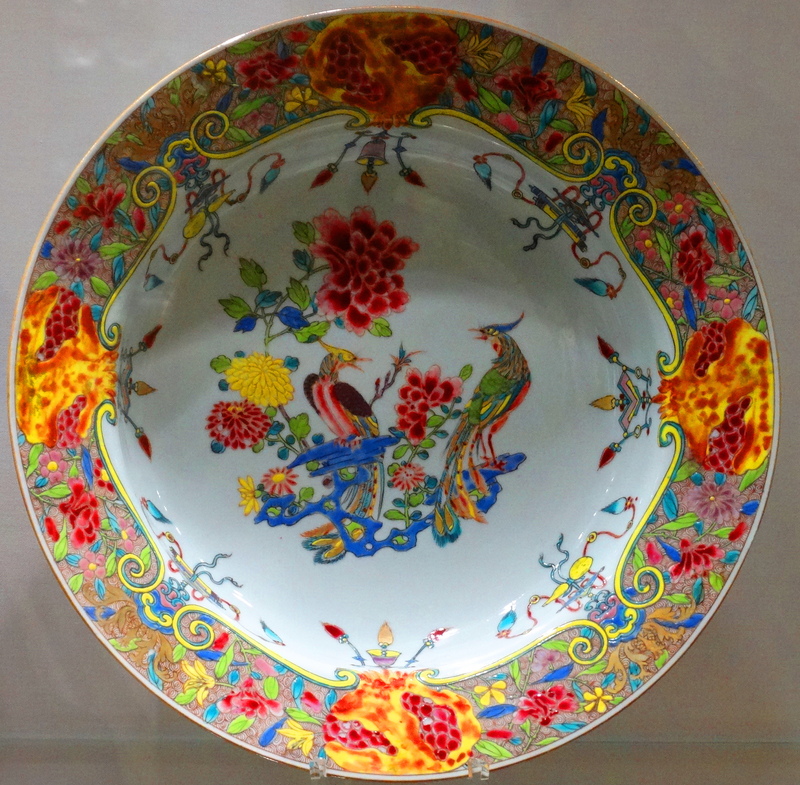 And I do love old China. The ones I took photos of were my favorites. I just always gravitate towards Asian art. I also have a penchant for Royal Copenhagen. They are made the same today as they were for essentially ever. Remarkable. Sets from different eras match perfectly. I agree with your perceptions, and share your appreciation! 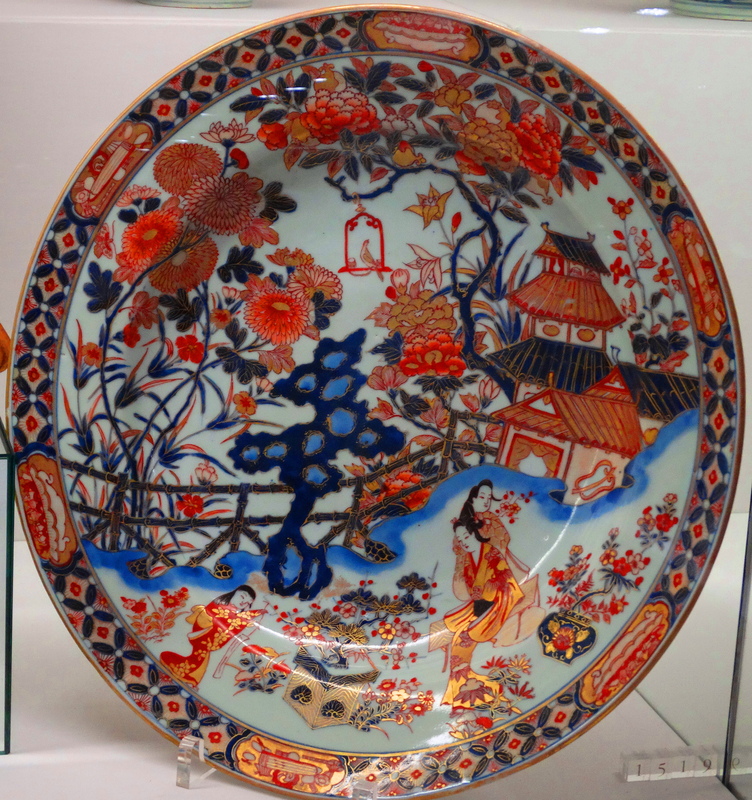 My heart beats faster for Asian art too, and I love it when sets continue to match through the ages. G’day Cindy and absolutely gorgeous, true! I used to work in printing and my biggest account was The Bradford Exchange, which is a company that makes collector plates and other trinkets. They also trade and sell plates like a stock market. It always cracked me up how apesh*t people would get when a new plate came out in the series they were collecting… And how disappointed they were when the plates aren’t worth what these are now…. Thank you for sharing. I don’t think I could eat off something so beautiful. I would also wonder if there are toxic paints in them… Wouldn’t that be karma? Fascinating story. 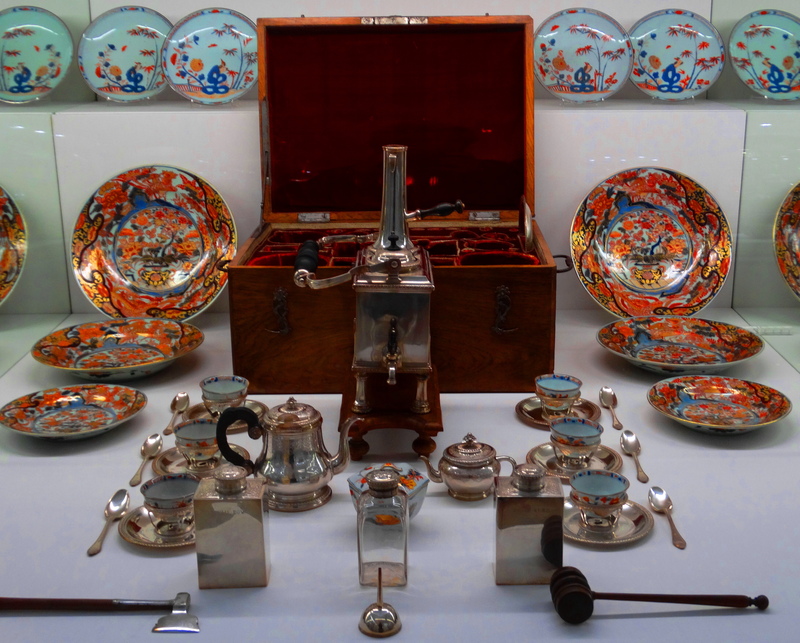 I would like to hear more…..Yes I think these particular pieces do belong in a museum. Interesting this need to acquire more and more that besets many people. I love beautiful things, but I have no compulsion to endlessly acquire them. Gorgeous pictures, Cindy – thanks for sharing them with us! What opulence, and what artistry went into it all! It is impressive isn’t it! Every one of those china patterns looks a little manic and AD, not to mention OC in having each complete set of mostly tacky patterns. Surprisingly modest bed. Was that a servants couch and His majesty was near by? A little gaudy for my taste, but quite the high-life! Indeed!! You probably would have liked some of the quieter patterns! Not a whole bunch of privacy when you are a royal. I like the little photos above his bed, near his head. Kind of homey in a sad way. I had to go back to look and see and you are right! So perceptive. I was surprised by the simplicity of his bedroom. I wonder why this was……..
Maybe for safety? Really though how much space does one need to sleep when they have a whole castle to roll around in? what a sumptuous life those rulers enjoyed! Hard to get your head around isn’t it!! superb. Brought me back in time to the castles I visited when living in Switzerland–and its surrounding countries. That dress is great! And so tiny–all the people were so tiny back then. thanks for giving a new lease with your lese majeste!! Wowzers!! Red is for passion!! The words, “Let them eat cake!” come to mind here — I don’t know why….! They are very beautiful dishes, and apparently well-taken care of. The dress is fabulous — I love dresses from that era! Thank you so much for taking us on this wonderful tour with you, and I’m so glad you didn’t get arrested by the Camera Police! I can “feel” the texture of that red wall! Nice! So happy you like them!! I could too!! 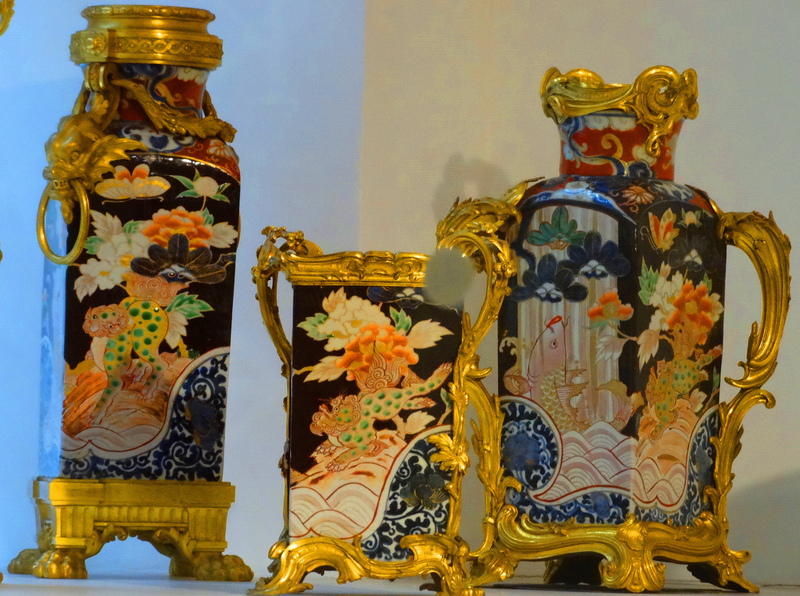 Thank you for the opportunity to view these beautiful pieces of china with such clarity…kudos to your photography skills. While I agree the opulence seems astounding, in all fairness to the Royal’s, it was necessary for the protection and growth of the kingdom. Wealth displayed by royal families was a political show of power that deterred would be invaders and attracted equally powerful allies. 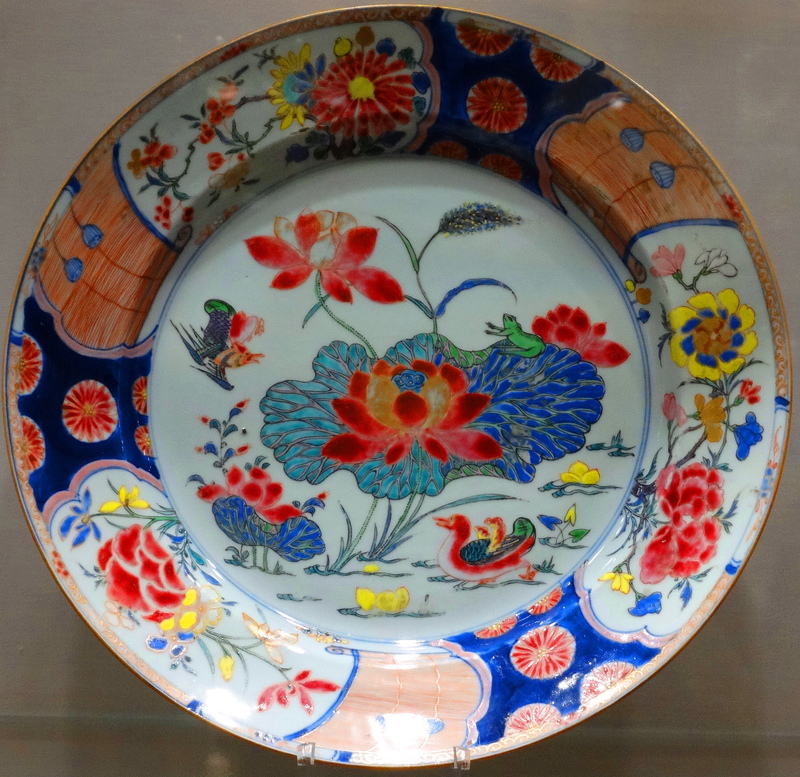 The manufacture of porcelain was as much an experiment in chemical science as an art and yes, dangerous chemicals were used. Most notably the white paint which contained high levels of arsenic. Thomas Bott a mid 19th century artist with Royal Worcester Porcelain was infamous for his use of white birds and cherubs on blue background, he would lick the end of his brush to get a finer point, a practice that ultimately lead to his death at the age of 41. Services were often given to royal families to commemorate a special event in the hopes a royal warrant would be issued. A warrant would ensure their success and allow the use of the word Royal in the name. When you consider this practice, as well as, the ownership of factories was often the state it lends some understanding to the sheer volume of services acquired. With all that said I agree that in some cases a narcissistic royal family member would begin to believe all this opulence was just for them and set in motion a bloody revolution…there’s one in every family. Thank you so much for your support of this post & cheers to you!